LG Gallery OLED TV to launch at IFA 2013 | What Hi-Fi? LG has unveiled its latest OLED TV ahead of IFA 2013, the LG Gallery OLED, model number 55EA8800. 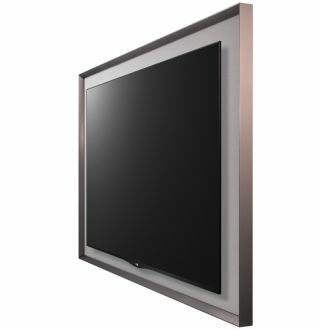 A 55 inch OLED TV, the Gallery OLED gets its name from the picture frame design, a canvas surround that also houses the TV's speakers. LG calls it an "elegantly understated frame", and the set certainly looks smart from the pictures, but the real clever technology comes in the form of the Canvas Speaker. A 2.2-channel speaker system promises crystal clear sound from the set to accompany the OLED images, which themselves promise to dazzle thanks to LG's WRGB technology, which delivers an additional white sub-pixel, and impressive off-axis ability. As befits the name, there's also a Gallery Mode, which allows you to show famous artwork and your own, perhaps less famous, pictures, on the 55in screen. The LG Gallery OLED TV will launch in Germany at IFA 2013 and will come to other markets in due course. This OLED TV joins the LG 55EM970V, which is on sale now for £10,000 in Harrods in the UK and the LG 55EA9800 curved OLED TV.